Our Packing list is based on the Ten Essentials. “**” means pretty mandatory. Printed out copies of Maps and Cue sheets. GPS and Phones are great, but you have to plan for a scenario where neither is available **. GPS Device. GPS drives can be an invaluable tool for routing and recording your ride. Check out our selection of Garmin devices here. Phone. A phone is a decent way to navigate, but uses alot of battery in GPS mode. Consider the phone to be your 3rd back-up. Head Lamp: These are great to have when trying to set up camp and cook, etc as the sun starts to go down. There are 2 types of nutrition you need for the trip. On-Bike and Campsite. For cooking at camp, you can either throw your food on the fire, or use a personal stove. There are many stoves to choose from, check out our Camp Stove Survey. You should be drinking plenty of water during the ride. The idea is to not wait ntil you are thirsty to drink. People will bring either water bottles or a carry-able bladder. Electrolyte tablets are also a common additive to water. You don't need to run out and buy a $3000 touring bike to participate in a Micro-Tour, but you do need a bike in good working order. We strongly suggest having you biked tuned up or at least looked over by your local bike shop. Dragging the bike out for the first time in 3 years and hitting the road for 50+ miles is not a good idea. For a Road Ride, we suggest a bike with drop handlebars. This bar configuration allows for multiple hand positions during longer riders. Bikes with flat bars are work-able, but there might be more fatigue issues as hand positions can't be altered. In addition, for a Road Ride, we suggest a bike with wheel diameter of 700mm or 27". In terms of tire width, we would suggest a size from 25mm to 40mm. These are not hard and fast rules. Gears are certainty strongly suggested, but not required. There are 2 major directions that you can go in attaching gear to your bike. On Micro-Tours, since it's only one night, you will find you need less than you think. After youy get experience on these trips, you'll know just what to bring. Traditional racks and panniers: The traditional method for attaching bags top a bike are through using racks and panniers (bags). Your bike must have the proper connection points to accept racks. 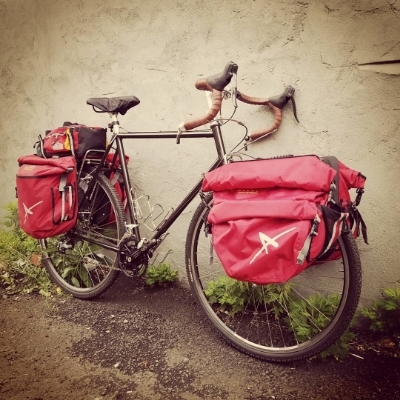 For an overnight trip like the Micro-Tour, you can probably get by using a pair of rear panniers (as opposed to the front/rear set-up shown below). Frame Bags: Another method for attaching gear to a bike is by sing frame bags. Frame bags attach to the bike with straps and Velcro, and are often an alternative to a bike that cant have racks attached. This method keeps the weight of your gear on the centerline of the bike, and eliminated the weight of racks. This method also forces you to be a bit of a packing minimalmist. Some riders will use a combination of these 2 approaches. Shelter: Most likely, you will opt to sleep in a tent. Tents come rated by the number of people that can fit inside (1-person, 2-person, etc). Modern tents are quite compact and easy to travel with. Consider sharing a tent with a friend so that only of of you has to carry it . Other options for sleeping include hammocks (slung from trees), or a bivouac (bivy sack). These options really get you close to nature, but carry the risk of exposure to inclement weather and should only be attempted by more seasoned campers. Sleeping: Sleeping bags are rated by the coldest temperature that will keep you warm at (30 degrees, 15 degrees, etc). The warmer the bag, the bigger it will be as more material is needed to keep you warm. Sleeping bags come either filled with down or with synthetic materials. Sleeping Pad: A sleeping keeps you comfortable as it fits between your sleeping bag and your tent floor. In addition to comfort, your sleeping pad plays a huge part in keeping you more thermally insulated. On-Ride: Most Micro-Tours are between 40 and 60 miles. A good plan would be to eat a hearty breakfast before setting out. While riding, you will need to replenish with both food and drink. There are 2 ways to carry water; water bottles or a hydration pack. Water bottles are a simple solution, plan to start with at least 2 full bottles that will be replenished along the way. Hydration packs (usually a bladder worn in a specifically suited backpack, with access through a drinking hose) are a great solution. Water is heavy, hydration packs allow you to carry more water weight efficiently. It also more conducive to drinking more often. Drinking often, and not when you're thirsty, is the key to staying hydrated.